"The best week in baking!" The iba is the leading world fair of bakery and confectionery craft. Be there, when the internationally booming industry again meets in Munich and presents the most important market innovations. 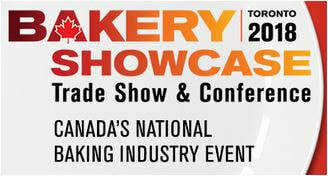 Canada's national baking industry trade show & conference. The event is held every other year in Toronto (Mississauga), it is the largest and ONLY baking industry B2B trade show & conference produced in Canada. Thank you for stopping by to see us at table top 205! It’s the biggest, most comprehensive event in the U.S. for the grain-based food industry, bringing together more than 20,000 baking professionals from 100 different countries and every segment of the business. It’s where new products are launched, great ideas are born and creativity and innovation unite. Every three years, the Baking Expo™ puts you at the center of it all—providing unparalleled access to the tools, technologies and resources you need to maximize your baking business’ success. Thank your stopping by to visit us at booth 8919!